Excited Grade 6 learners from Kleinmond Primary School were treated to a guided tour of the Two Oceans Aquarium to celebrate World Oceans Day on 8th June. The trip to the V&A Waterfront in Cape Town was organised by the Marine Stewardship Council (MSC) in recognition of the active role the learners are taking towards improving the marine environment in their community. For most of the children, all proud members of the ‘Friends of the Ocean Club’, this was their first trip to the aquarium. ‘Friends of the Ocean’ was founded by Kleinmond community member, Mr William August, as part of his EcoEnviro initiative. The initiative aims to create partnerships with other environmental and social organisations, and to raise funds for educating and inspiring local children to care for their environment. “My goal is to improve the awareness and prospects of children from our community and get them to understand and appreciate the world around them and in so doing, help them create a better future.” said Mr August. The Kleinmond fishing community is currently involved in a pilot Fishery Improvement Project with WWF-SA. The project, which focuses on the small-scale fisheries in the Kogelberg, was set up to address the challenges facing the small-scale fisheries sector and is based on a pre-assessment against the MSC Fisheries Standard. 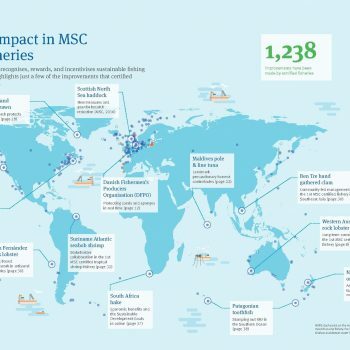 Angela McQueen, Communications Manager of the Southern Africa office of the MSC says “The MSC is committed to increasing the accessibility of our program to more fisheries and is increasingly engaging with the small-scale sector. 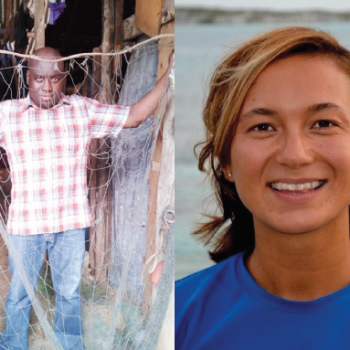 We have developed a series of tools, funding and training initiatives aimed at helping these fisheries take their first step on the road to environmental improvement”. The Kogelberg coastline extends 65 km from Gordon’s Bay to Botrivier, and is an important conservation area for many of South Africa’s threatened linefish species, as well as iconic species such as abalone and West Coast rock lobster. Fishing communities in this area number amongst those in South Africa for whom the ocean plays a critical role in food security.